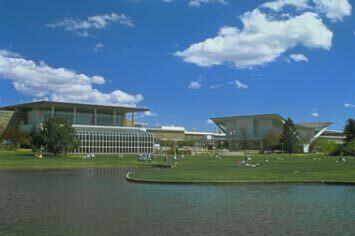 The Charles A. Lory Student Center is the focus of activities, programs, services and facilities dedicated to enhancing Colorado State University community in an environment that embraces diversity. 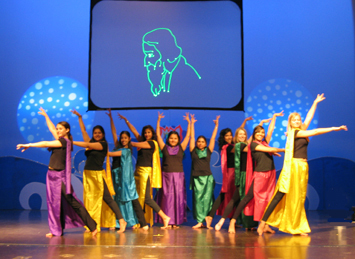 A scene from Manick Sorcar's "Synergy", the opening item of "ASIA FANTASIA", at the Lory Student Center. (Photograph by Timothy Adams). Manick Sorcar, with wife Shikha, donate their show proceeds to: Andy Sirotnak, MD, FAAP, the Director of the Kempe Child Protection Team, standing next to Lois Robinson, Secretary, and Stephanie Stronks Knapp, Co-Director of the Kempe Child Protection Team, all with COPSAC (Colorado Professional Society on the Abuse of Children). The event started sharp at 2 PM. “Asia Fantasia”, the mega 3-hour event to raise money and awareness for the victims of tsunami took place at the Lori Student Center. The event, which was a multi-cultural entertaining program performed by artists from USA, India, Indonesia, Thailand, and Sri Lanka was highly successful raising over $10,000 for the tsunami relief agencies in affected countries. It was organized by the India Association of North Colorado, India Student Association, Thai Student Association, Indonesian Student Association, Sri Lanka Student Association, and the Faculty of the Colorado State University at Fort Collins. The highlight of the program were two items by Manick Sorcar Productions: the Opening Item “Synergy”, and the Grand Finale “Underwater Fantasy”. The event had a big news-splash in “The Coloradoan”, the popular newspaper of Fort Collins, which printed a large picture of one of Manick Sorcar’s item. Prior to the opening of the main curtain, the children from Fort Collins elementary schools held candles while Dr. Lena Sunthankar sang a prayer to begin the program. The audience, volunteers, performers - all joined together in a moment of silence to remember victims of tsunami halfway around the world. The goal of “Asia Fantasia” not only was to raise funds for the tsunami victims, but also to bring an understanding and awareness of the various types of cultures of the people of that part of the world. Sorcar’s items contributed specifically to that awareness. In “Synergy”, sixteen dancers of different demographics danced together in harmony various forms of dances of East and West, finally arriving synthesis. With fusion music at the background, the dances were combined with dynamic innovative lighting effects by moving-head intelligent lighting and various forms of graphics, animation, and over-head visual effects by laser, originating from the Statue of Liberty torch. The innovative item, which was a symbol of love, peace, understanding, and awareness was dedicated in memory of the victims of tsunami. The grand finale items was Sorcar’s “Underwater Fantasy”, where the audience was transported from the seats to the bottom of the ocean. In the dreamlike colorful setting they were able to be with the under-water creatures and witness the rescue of the fairy-queen. The dance director for both items was Payal Sorcar. The other entertainment items included a well-demonstrated slide show of tsunami rehabilitation, impromptu music by Indo-American Jazz Fusion Ensemble, Indonesian Folk Songs, a classical solo dance from India by Poudre High School IB Girls, and an Indonesian Martial Arts demonstration. The audience also learned welcome sayings in Arabic, Indonesian, Sinhalese and Tamil - languages spoken by those who were most impacted by the tsunami. More than 50 items were sold in silent and live auctions which included everything from restaurant gift certificates, homemade meals, Jin Shin Jyutsu (Ancient Japanese Healing Art, to an autographed picture of Arnold Schwarzenegger, the famous film star and the current Governor of the State of California. Ken Salazar, the Senator of the state of Colorado, sent his "sincere respect and appreciation" to participants in a letter saying he "appreciated the hard work and effort to coordinate the extra-ordinary benefit show." Performing charity shows for raising funds is not new to the Sorcar family. 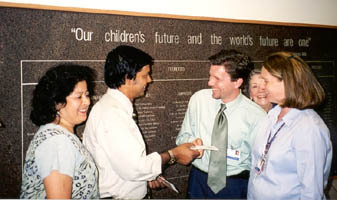 Proceeds from their programs in 2001 were donated to the Kempe Child Protection Team, and to the Red Cross for the tragedy of 9-11 at New York.